Stop Wearing Your Dentures While You Sleep! Mouthguards are often worn by athletes engaged in sports that carry the risk of dental injury — such as basketball, football, hockey, and some two dozen others; wearing one is a great way to keep your teeth from being seriously injured. But Raonic’s mouthguard isn’t primarily for safety; it’s actually designed to help him solve the problem of teeth grinding, or bruxism. This habitual behavior causes him to unconsciously tense up his jaw, potentially leading to problems with muscles and teeth. Bruxism is a common issue that’s often caused or aggravated by stress. You don’t have to be a world-class athlete to suffer from this condition: Everyday anxieties can have the same effect. The behavior is often worsened when you consume stimulating substances, such as alcohol, tobacco, caffeine, and other drugs. While bruxism affects thousands of people, some don’t even suspect they have it. That’s because it may occur at any time — even while you’re asleep! The powerful jaw muscles that clench and grind teeth together can wear down tooth enamel, and damage both natural teeth and dental work. They can even cause loose teeth! What’s more, a clenching and grinding habit can result in pain, headaches and muscle soreness… which can really put you off your game. Â An occlusal guard is made from an exact model of your own mouth. It helps to keep your teeth in better alignment and prevent them from coming into contact, so they can’t damage each other. It also protects your jaw joints from being stressed by excessive force. Plus, it’s secure and comfortable to wear. 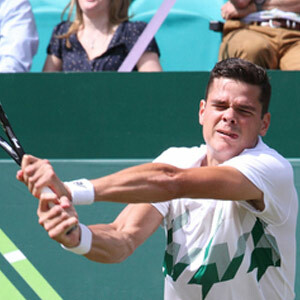 “I wear it all the time other than when I’m eating, so I got used to it pretty quickly,” said Raonic.